Lindamade » I’m a Berni-nerd!!! It’s true. There’s no other way to describe how I dorked out last night after I went to pick up my new Bernina and took it for a spin in the intro class. I am in LOVE. It’s there, in the back, waiting for me to pack up my old machine. The things I am most excited about include decorative stitches (above) and the freeform quilting foot I just purchased (evidence below). Don’t worry, my old curvy singer is going to California to a friend who works at a nonprofit for Senior Citizens. 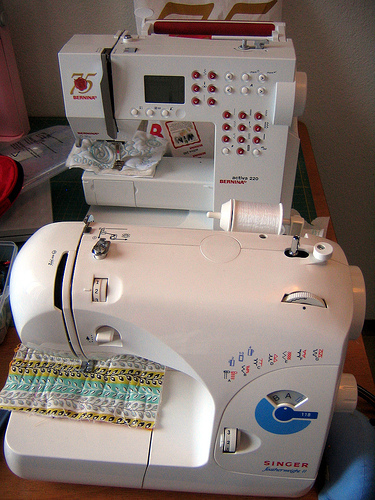 Hopefully lots of people will get to sew on her, she was (& still is) a good machine. I’m a firm believer that you can do whatever you want with whatever you’ve got, no matter your level of machine. But I upgraded because I really wanted to be able to lower the feed dogs on my machine. Yep, that’s the #1 reason. 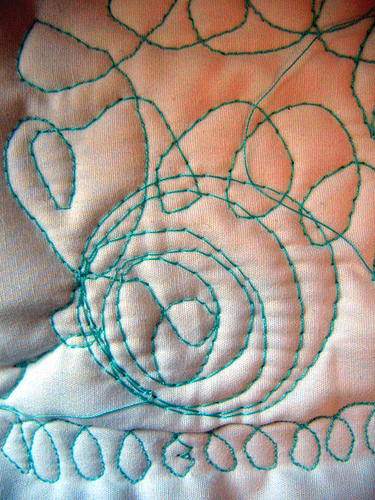 No more turning the whole freaking quilt just to go in another direction. I also love how smooth and quiet this machine is. Oh, and I can sew into nothing (like one might do while chain piecing) and the bobbin doesn’t freak out. Hooray!! And thank you Mommy! Oh I wish my machine could do that... but you're right, some people can do amazing things with the most basic models. In Portugal I saw a woman embroider tablecloths with a foot pedalled singer (or similar), she was using zig zag stitch to attach embroidery floss to the cloth, and it was a real work of art! And she was quick at it, too! yay! i love my bernina too. it's so smooth and can sew through anything (or nothing!). my only gripe is the cost of the presser feet. a walking foot is $100!!!! i guess it's worth it though. these babies last forever. You are going to have so much fun lowering those feed dogs! Enjoy ! Oh, I am super jealous! She's an absolute beauty! Have fun!